Have you been looking into data center airflow management basics? Comparing containment systems can be daunting. In the past decade, many companies have become aware of the advantages of data center airflow management practices that include containment systems. It is also now well understood that as the average heat load per cabinet rises, simply arranging cabinets in a traditional open hot aisle/cold aisle configuration is not an effective approach. Industry associations have considered indirect and direct liquid cooling as possible solutions for high density applications, but using a containment system with perimeter cooling is still a very capable solution for today’s average rack densities and the anticipated densities over the next decade. Furthermore, containment systems support retrofit from hot aisle/cold aisle, economizer applications and free air cooling. 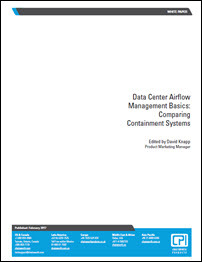 This white paper examines and compares three data center containment systems and demonstrates that there are important differences to consider that distinguish one system over the others. It will help you to determine the best containment option for your data center requirements and your business goals.